By losing up to 325kg compared to its predecessor, Audi’s latest Q7 is able to capitalise on fuel efficiency and clean emissions from its latest V6 diesel engines. Geoff Ashcroft reports. Audi’s latest Q7 is everything a premium SUV should be. This leaner, lighter 4x4 is refined, relaxing to drive and powerful. The interior is spacious, classy, and the Q7 is bristling with tech too. There is a choice of two V6 3.0-litre diesels and both are coupled to an eight-speed automatic transmission with the firm’s Quattro permanent four-wheel drive. It glides through ratios in an imperceptible manner. Our test model was the higher-powered 272hp version, and it handles the Q7’s size with ease. Rapid progress is only a squeeze of the throttle away. Interior is spacious and classy. 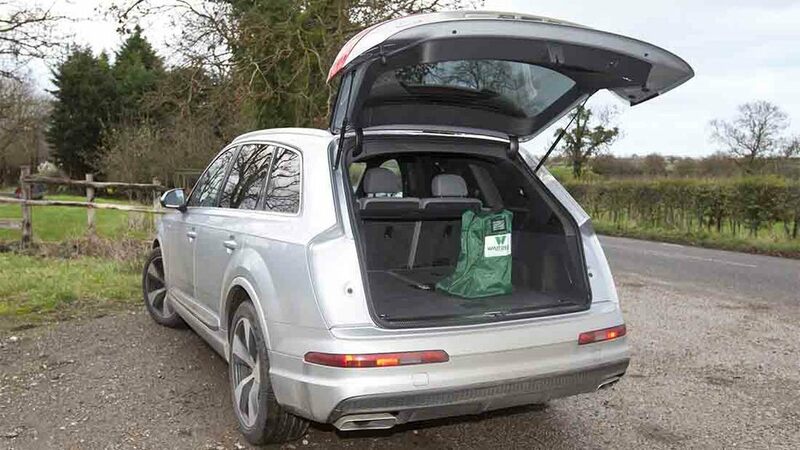 Audi’s optional adaptive air suspension was fitted to our test model, and at £2,000, it takes a bit of swallowing. But you do get the option to tweak the ride between comfort and sportier settings - and the difference is noticeable if you are seeking an unruffled ride. It might not be sports car firm, but at both ends of the scale it does a good job of soaking up bumps, or restraining the 4x4’s body movement on twisty roads. Behind the wheel, you are faced with a myriad of buttons, functions and commands. But like a Fendt Vario, the Q7 can be as complex or as straight forward as you make it. Virtual cockpit provides a 12.3inc TFT display that can be tailored to suit. 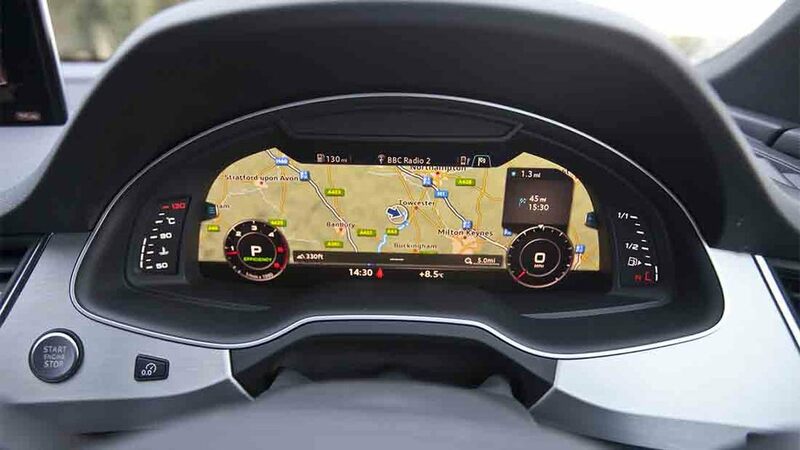 We like the virtual cockpit TFT screen that forms the basis of the car’s dashboard. Replacing analogue dials, it enables you choose classic dials or an extensive infotainment view that shrinks the dials and fills the space with navigation mapping, phone, radio or car data. 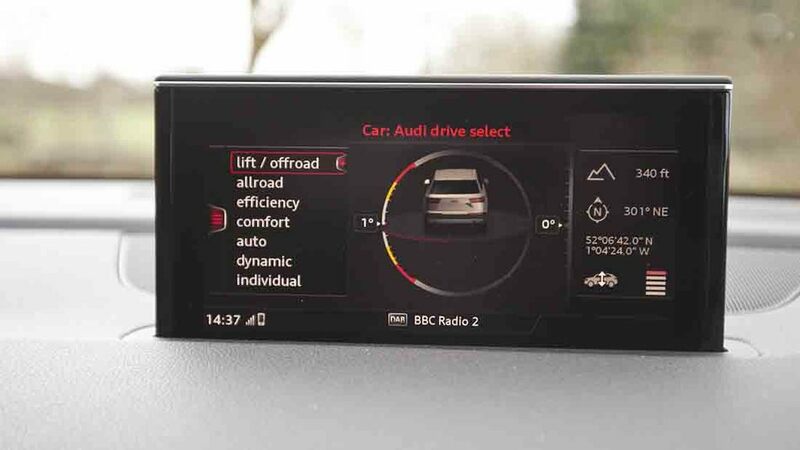 Clever driver assistance data uses the navigation to warn of forthcoming gradients, junctions and roundabouts, inviting you to lift and coast to save fuel too. A pop-up screen provides additional information. There is also an 8.3in pop-up display screen that sits on top of the dashboard - luckily, it can be retracted out of the way, but its not a mirror of the dashboard screen. It can be used to show different information. A fingertip touch pad on the centre console lets you make short cuts through the car’s Multi Media Interface (MMI) system by typing letters or numbers onto the pad. Great for left-handers, though not quite as practical to use if you are right-handed. With its shortcuts and intuitive design, MMI blows Range Rover’s infotainment system into the weeds. Load space or extra seats - you decide. There is plenty of it. Q7 offers seven-seat practicality, and that means van-like proportions when its five rear seats are folded flat. It will probably satisfy most people’s space requirements when using five seats for passengers, but if not, it will handle a 3,500kg towing weight too. It seems Audi’s Q7 has evolved into everything a premium SUV should be. Next: Who will milk the cows of the future?